There's no question that "Burn The Floor" fans the flames at The Colonial Theatre. It's fast, fun and frenetic sizzle, grabbing the audience from the get-go -- which, in fact, is accompanied by the growling rumble of thunder, giving an indication of the lightning to follow. Each of the two acts is divided into two sections. Each section is then divided into multiple segments showcasing various dance and musical styles. So whether you're a fan of salsa, jive, rumba, cha cha, the fox-trot, waltz, paso doble or tango, you'll be happy with what you see. And certainly the company of dancers is easy on the eyes. Favorite moments include the sections entitled "Sway," "Nights In White Satin," Let's Face The Music And Dance" and "Ding Dong Daddy" as well as and a sort of history lesson allowing the dancers to show off their individual skills through a melange of styles demonstrating the range of the art. Every one of the performers is first rate, but you'll definitely notice Pasha Kovalev, Ana Garnis (together, photo above), Giselle Peacock and Karen Hauer. Special note as well to Igor Dogoter and his partner Natalia Gorshkova for their swirling, romantic waltzes. The dancing is augmented by the occasional talents of vocalists Vonzell Solomon and Peter Saul. Both are fine, but neither can match the "vop" quality of the dancing. Choreographer and director Jason Gilkison has done a mammoth job of putting the dancers through their paces. It's a wonder to watch the configurations and patterns throughout the individual numbers. Sometimes it's two dancers. Sometimes it's all 16. Then several spin into the wings while others regroup centerstage. Then they meld together as one before breaking apart into the darkness to be replaced by others spinning in from out of no where. The only hiccup, if there is one, is that the evening is presented pretty much at an even level of frenzy. It's kind of the equivalent of seeing an entire email in ALL CAPS. There are one or two moments where things are a little more sweet and quiet, but it's like a light switch being either on or off. Despite the pleasures its offers, the evening could benefit from a little diversity in pacing and intensity. Technically, the show is sharp all the way. Lighting by Rick Belzer is razor perfect and adds tremendously to the emotional foundation of the production. And in dancing, it's all about the beat, so kudos as well to percussionists Joseph Malone and Henry Soriano. The insane level of energy barrels on to the very end (there's a knock out version of "Proud Mary" -- above -- followed by "Turn The Beat Around") whereupon the audience files out of the theater having just consumed the theatrical equivalent of 28 cups of coffee. 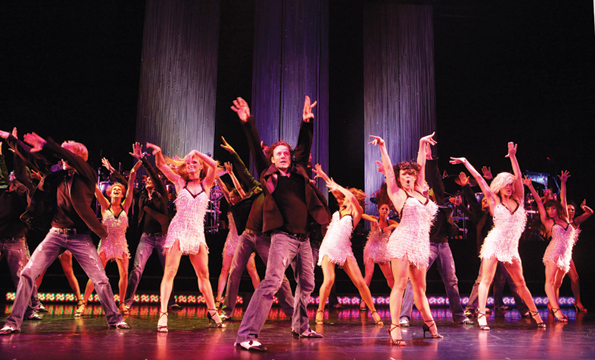 "Burn The Floor" is at The Colonial Theatre through March 13. For information, call 800-982-2787.